Risperdal (risperidone) was not originally intended to be used as an ADHD treatment, but its extensive off-label use has become a lightning rod for controversy, confusion, and anguish for parents whose children have suffered after using the powerful antipsychotic medication. Developed by Ortho-McNeil-Janssen, a subsidiary of Johnson & Johnson, Risperdal belongs to the class of drugs known as atypical antipsychotics. It was FDA approved in 1993 specifically as a treatment for schizophrenia and for bipolar disorder in adults, and in 2007 for pediatric schizophrenia and pediatric bipolar disorders. However, the FDA specifically warned Johnson & Johnson not to market Risperdal for any other use in children, including ADHD, because of serious safety concerns. A growing number of Risperdal lawsuits have been filed across the country after children taking the drug for ADHD developed serious side effects, including gynecomastia. ADHD is one of the most common and fastest growing childhood disorders with a usual onset between the ages of 3 and 6. The risk factor for having ADHD is 4X higher in boys than girls, and the condition can last well into adulthood. The Centers for Disease Control (CDC) reported in 2011 that one in every nine children or 6.4 million were diagnosed with ADHD, a 42% increase over the previous eight years, and the number of children diagnosed now grows by 5% annually. Risperdal and other antipsychotic drugs are currently being used to treat 3.5 million children for ADHD. Researchers believe some of the causes of ADHD are a combination of genetics (ADHD often runs in families), environmental factors such as tobacco or alcohol use during pregnancy, high lead levels in an old school building, and a possible link between hyperactivity and food additives such as coloring and certain preservatives. The three classic behaviors that characterize a child with ADHD are hyperactivity, impulsivity, and inattentiveness. The inattentive child is easily distracted, quickly bored, and may have difficulty focusing on or completing a task at hand unless it’s enjoyable. The hyperactive child is a non-stop talker who has trouble sitting quietly in school or at dinner and will constantly fidget and squirm in his or her seat. The hyperactive child finds doing quiet tasks or activities very difficult and is easily distractible. The impulsive child is extremely impatient and does not want to wait for the things that they want. They are often inappropriate in their comments and show little or no restraint in their emotions. The impulsive child has little or no regard for the consequences of their actions or the feelings of others. Misdiagnosis of ADHD is common. A 2010 Michigan State University study showed that as many as 1 million children may be misdiagnosed as ADHD. The diagnostic task falls to a licensed health professional to pull together a range of environmental, genetic, social, medical, and educational information to make the proper call. Unfortunately, there is no cure for ADHD, so treatment focuses on relieving the symptoms of ADHD and improving day to day functioning through medication or a combination protocol of medication and behavioral therapy. Ironically, the medication of choice for many ADHD sufferers is a stimulant which has a calming effect on a hyperactive child and can improve his or her ability to focus, work, and learn. In a recent study, a minimum of 80 percent of children with ADHD responded positively to a stimulant ADHD medication, according to the American Academy of Pediatrics (AAP). Once Risperdal received FDA approval for schizophrenia and bipolar disorders in 1993, Johnson & Johnson researchers quickly found an off-label use for Risperdal to control the self-injury, aggression, and temper tantrums in autistic children. Risperdal was effective in reducing those behaviors but was not granted FDA approval due to safety concerns of an antipsychotic drug being used on children. Despite the warning from the FDA not to market Risperidone for use in children, Johnson & Johnson saw the opportunity to aggressively promote the off-label use of Risperdal for ADHD treatment because of the medication’s effect on aggressive autistic behavior, driving Risperdal to a 50% market share by 2007. Gynecomastia: development of breast tissue in males. Particularly traumatic to a young boy or adolescent who must endure embarrassment and surgery to have the breast tissue surgically removed. Pituitary Issues: premature breast development in young girls including lactation and possible pituitary tumors. Tardive Dyskinesia: movement disorder causing abnormal facial and limb movements. Often irreversible even when drug is discontinued. Neuroleptic Malignant Syndrome: serious life-threatening reaction causing muscle rigidity and irregularities in pulse and blood pressure, uncontrollable fever. Diabetes: dangerously elevated blood sugar levels. 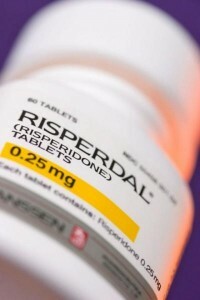 Stroke: studies linked Risperdal to an increased risk of stroke, especially in elderly patients. There have been at least 1,207 serious adverse events, including 31 deaths, associated with Risperdal use in children between 1993 and 2008. The first Risperdal lawsuit against Johnson & Johnson was filed in 2010 by a young man who had been prescribed the drug for off-label use between 1999 and 2004. He developed gynecomastia and suffered serious physical and emotional trauma. The case was settled in 2012 by Johnson & Johnson on the first day of trial for an undisclosed amount. In 2008, Johnson & Johnson was fined $1.2 billion in an Arkansas federal court for Medicaid fraud and downplaying risks associated with the drug, including the link between Risperdal and male breast growth. In 2012, the company paid $924 million in Risperdal settlements to various states for improper marketing techniques. In 2013, Johnson & Johnson paid another $2.2 billion to the Department of Justice to avoid prosecution for misbranding Risperdal. There are currently hundreds of Risperdal lawsuits waiting to be tried, most involving boys and young men who are suffering from the stigma of gynecomastia.